Thanks for checking out our dev update, coming to you this week from Sledge (I’m filling in for Eric). We have a lot of things in motion right now, which makes it an exciting time (and also a really busy time) for us. As you know, we are wrapping up work on our first Alpha, which is really going to be a technical demonstration of the core mechanics in Gears of Eden. 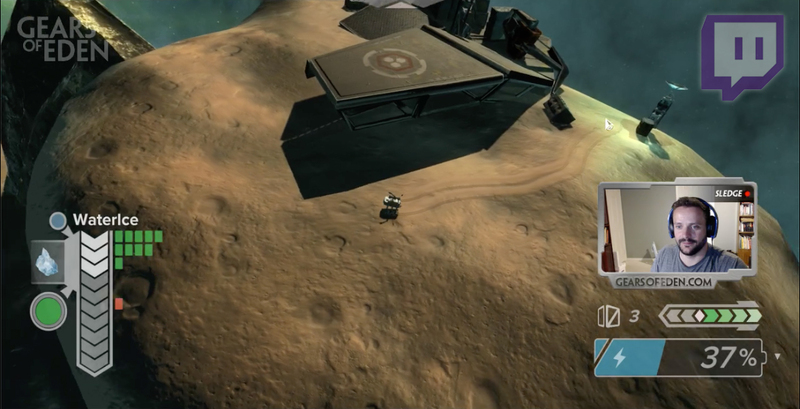 There won’t be much of anything for you to do in terms of gameplay value, but you will be able to experiment with driving around and exploring the asteroid, reading some dialogue, finding and digging up resources, and crafting a couple small items. For more details, please check out our early access info page! If all goes well, we should be announcing a release date for Alpha-1 within the next couple of weeks. Our other big focus lately has been on you. Yes, YOU! We are an indie dev studio trying to reach our audience directly. Our goal isn’t to approach investment groups or other studios and make the game they want us to make. We want to go directly to you, our audience, and make this game with you and for you. That means we want you to be involved in this journey with us, and that means that we need to provide some value to you for doing so. We’re attempting this in a number of ways: we have rewards for backers, we produce a bi-weekly podcast, we are working on a series of short stories (the first of which is now being edited), and most recently… we’ve started a Twitch channel! The short of it is that game development isn’t easy or free, and we can only get so far on our own without your support. And, at the same time, we realize we need to produce content with value for you to make this relationship work. So, we are going to keep generating content for you and explore some systems like Patreon to allow you to easily partner with us. More on this in coming weeks! Speaking of Twitch. We are really excited about Twitch. Okay, I am really excited about Twitch. Eric one day casually mentioned the idea of streaming as a possible tool we could explore in the nebulous “future”. The next day I was streaming on Twitch, remote desktoping into my laptop to use it as a webcam in a bit of a mechanical-Frankenstein setup. It’s been so much fun. And I actually have a dedicated webcam now! But, honestly, I think Twitch is a great way for us to connect with you. Eric, Michael and I have all been on in the past week streaming games like Kerbal, Overwatch, Little Nightmares and of course, Gears of Eden. It’s a great platform to hang out and answer any questions you have, and you get the extra benefit of laughing at us LIVE! We’d love to grow our followers to 50 to become eligible for Twitch’s affiliate program, so be sure to check us out on Twitch and let us know what you want to see! Before signing off, I also want to let you know the dialogue editor we’ve been working on for the last few weeks is complete! Eric and I have already placed a lot of dialogue into the game for testing, and the rest of the dialogue should flow in this week! This has been the last major implementation needed to complete our first Alpha, so we’re super excited to finally have it in the game. All that is left now are a few last minute checks and touch-ups. That’s going to do it for this week’s update. As a reminder, we have a new edition of our Podcast, Reaching Eden, coming out this weekend. You can find it on iTunes, GooglePlay, our website, or wherever you find your podcasts. As always, be sure to follow us on Twitter, Facebook (and now Twitch) for the last updates from Gears of Eden!